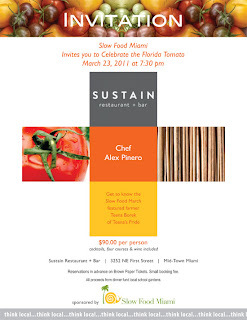 March 23, 2011: "Celebrate the Florida Tomato," a Slow Food Miami event at Sustain Restaurant + Bar. Sustain will be putting together a 4-course menu featuring local heirloom tomatoes from Teena's Pride Farm. Starts at 7:30pm, $90pp including cocktails, four courses and wine. Click the link or the invitation below to reserve. April 1, 2011: Johnson & Wales Distinguished Visiting Chef Dinner with Chef Kevin Sbraga, winner of Top Chef Season 7 and a graduate of J&W's North Miami campus. The menu preview includes lobster bruschetta and veal sweetbread hors d'ouevres, caesar salad with sous vide chicken, fish and chips with "a variation of tartar sauce," meatloaf with chanterelles, bacon marmalade, pickled onions and truffles, and a banana split with strawberries, chocolate ganache and pineapple. The event, which is a scholarship fundraiser for the University's College of Culinary Arts, starts at 7pm at Johnson & Wales' North Miami campus. Seats are $85pp, RSVP to 305-913-2108. 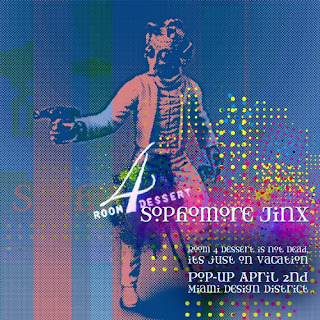 April 2, 2011: "Room4Dessert 2" - a 6-course, pop-up dessert tasting by Chef Will Goldfarb, the self-styled "ultimate outlaw of pastry." 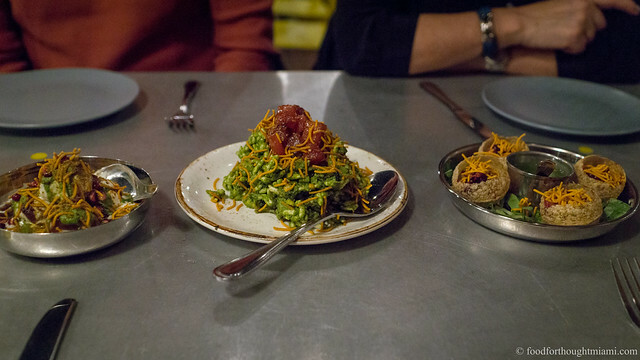 Two seatings (8pm and 10pm), $75pp, with assistance from some local suspects and paired wines. Click the link above or the picture below for more info.